I do lovely a novelty nail; albeit magnetic, pressed flowers, caviar, concrete.. Name it, I have probably tried it! I get complimented on my nails quite a lot, purely because people can't believe that my nails are my nails. "Are they real? Where do you get them done?" etc etc. Which is nice as I do love my nails and as I work in a jewellery shop, it is important to stay clear of the chipped, bitten down nails. It is also quite weird to say but one of the first thing I look at when meeting new people is their nails. Just to see. Y'know. Anyway! 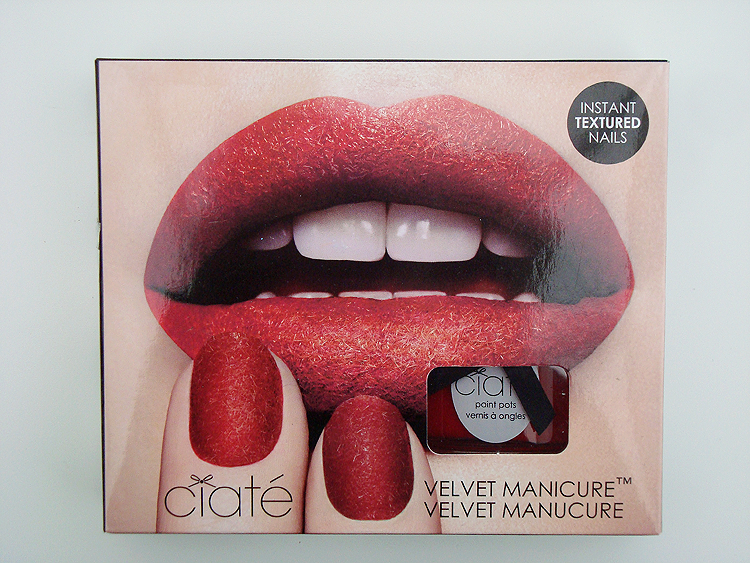 One trend I have yet to try is the velvet manicure. 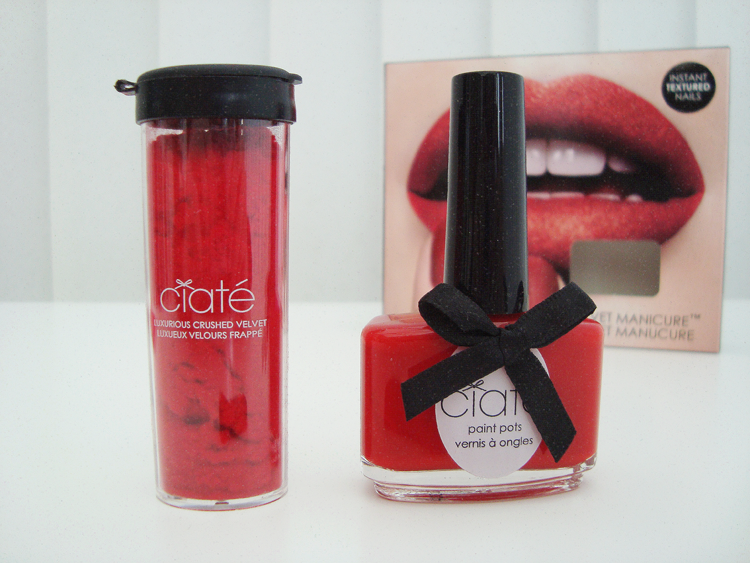 For my birthday I received the Ciate Red Velvet Manicure Set which was very exciting and I was intrigued to see what the end result would be. Like with most nail trends, before I try them out I do ponder them. "Do I need my nails to feel like concrete? Do I really want pressed flowers stuck to my nails? Do I want my nails to feel like velvet?" Paint your nails with the Boudoir nail polish then working with one nail at a time, apply another coat of Boudoir before sprinkling the crushed velvet on top of the wet nail. Brush away any excess with the little black brush and leave to dry. I found that I had lots of fun applying this manicure. 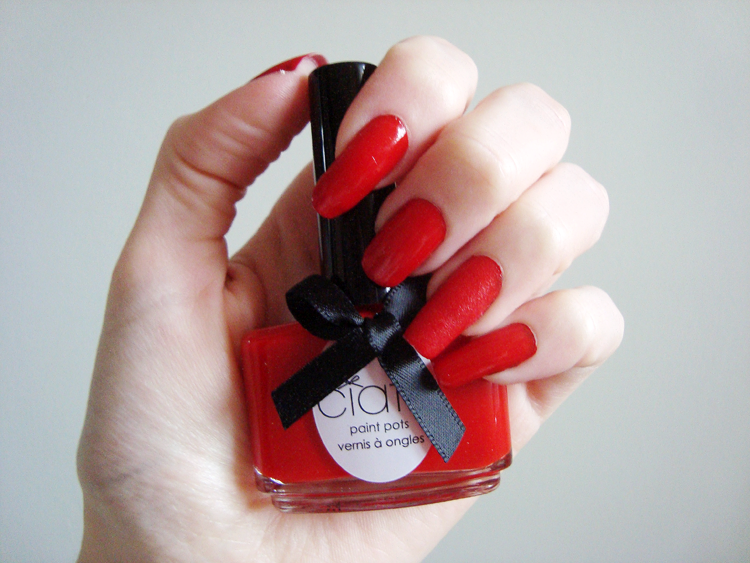 To begin with I thought it would be too much faff and hassle but once I had painted my nails with the bright red polish and had opened the velvet pot, I, lamely, got a bit excited at the prospect of sprinkling it over my nails. I decided to apply it as an accent nail first, just to see what it would look like. I enjoyed shaking the very finely crushed velvet over my nails although I found it slightly trickier when applying this to my right hand as I am right-handed. I found that I needed to shake quite a lot of the crushed velvet over my nails to fully cover them with velvet. It was slightly messy so it is best to apply it over a sheet of paper or on an easy-clean surface as the velvet can get everywhere! 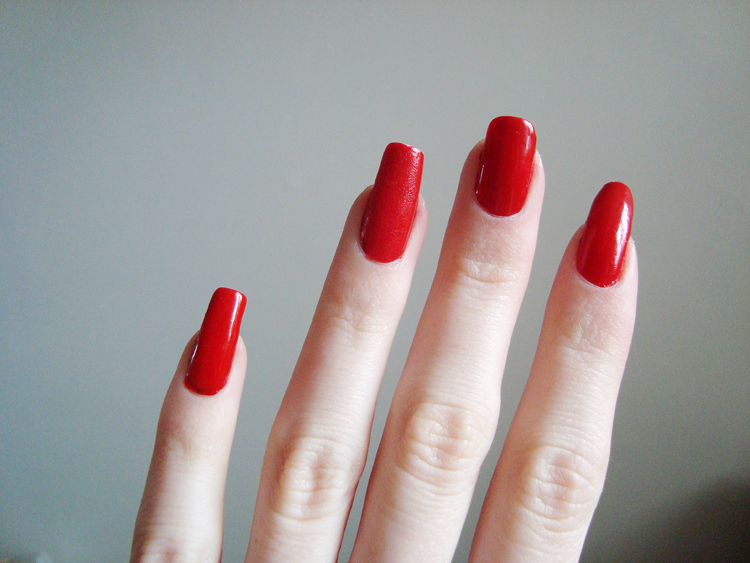 Once my nails had dried and the velvet had set, I was a bit like an over-excited child. My nails felt like velvet! I was so happy. When I was a child my favourite things to play with were my velvet and felt shapes, this Ciate set brought back all the feels!! Obviously you cannot apply a top coat to the velvet so I was a bit worried about how long they would last but unbelievably, they have lasted nearly two weeks without chipping. I have had to re-apply the red nail varnish to my other nails a couple of times due to minor chipping but the velvet has just not budged. For that, I am incredibly impressed. 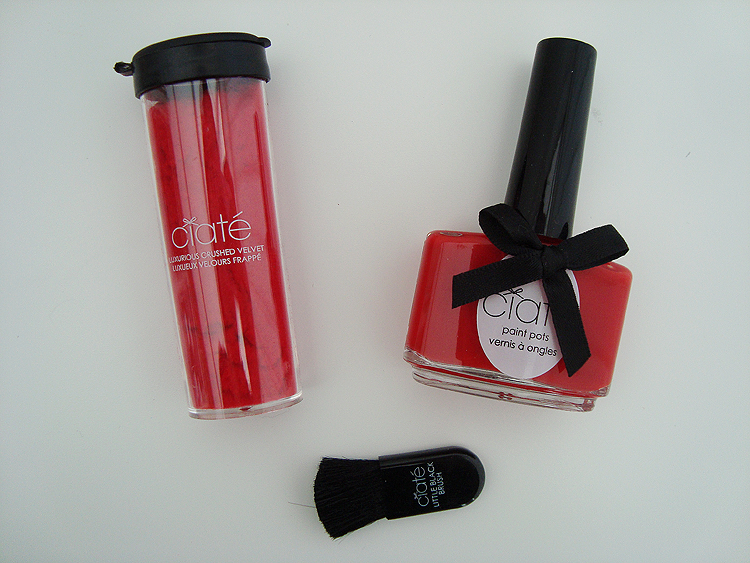 Whilst I might not wear the Ciate Red Velvet Manicure Set day in day out, it does make a nice change to a plain, bold, one colour nail. Two weeks is amazing with no chipping!